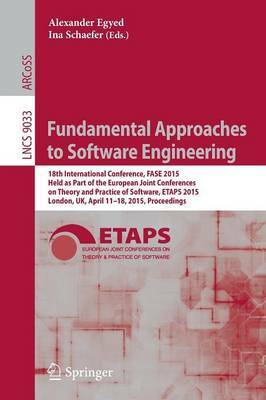 This book constitutes the proceedings of the 18th International Conference on Fundamental Approaches to Software Engineering, FASE 2015, held in London, UK, in April 2015, as part of the European Joint Conferences on Theory and Practice of Software, ETAPS 2015. The 22 full papers and 1 short paper presented in this volume were carefully reviewed and selected from 80 submissions. They are organized in topical sections named: models and synthesis; testing and fault localization; modeling; verification; modeling and adaptation; and applications.